Pennsylvania Castle – How to Keep Children Entertained. 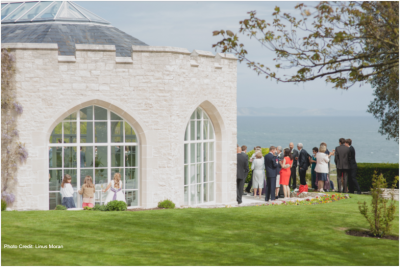 Pennsylvania Castle on the Isle of Portland is one of Dorset’s top wedding venues. 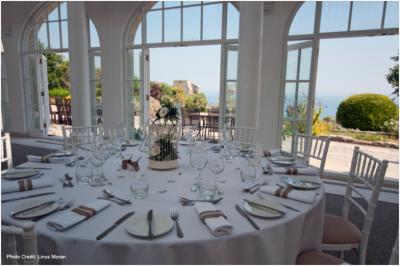 Perched on a cliff top with stunning sea views and idyllic gardens, the fairy tale castle is perfect for intimate and bespoke indoor or outdoor weddings. With more children attending their parents’ weddings than ever before, it is only right that the children should be treated like royalty too. Getting the right balance of inclusion but without disruption is a balancing act that Penn Castle have perfected over many years. Pennsylvania Castle is very fortunate to have a great relationship with a wonderful nanny service, who are experts at keeping all small people occupied throughout their time at The Penn. While of course there are always relatives and grandparents on hand to help with children, they don’t want to miss out on any of the important speeches or fun, so a nanny service gives the families a break too and ensures no one misses any of the main event. The Penn team liaise with the nannies to make sure they are ready for photos or other special moments through the day, which is so important in ensuring the children are still very much part of the special day. The families are safe in the knowledge that the children are being well looked after and therefore they enjoy the day stress free. The nanny service can be completely bespoke and tailor made to the couple’s requirements. The Penn have seen it all, from designated children’s dining rooms with time carved out for an after dinner nap, to areas set up for endless games or arts and crafts. Guests bringing their own children can also come and go throughout the day. One to one nanny services are also available for those children staying at the Castle once it gets to bedtime, even if the party is still going strong downstairs, there is never any need for you or your children to miss out on the fun at Pennsylvania Castle. Involving children in weddings can often seem like a daunting task, but at such a special time, children should be able to enjoy the magic and make the memories just like you. Knowing that this is all in hand and taken care of is a relief not only for the bride and groom but for the grandparents too!